It had to happen... a week without any new anime reviews, or indeed anime news. You’d think that this would mean a very sparse Review Roundup (just the thing I created that ‘What I’ve Been Mostly Rewatching’ section for, but I can still bring you one new review. For Sion Sono directed Tokyo Tribe, based on the Tokyo Tribe2 manga by Santa Inoue. If you’re into your live action adaptations of manga, then it’s worth checking out Tokyo Tribe, billed as the world’s first ‘battle-rap musical’. It’s set in an alternate Tokyo where the various districts are split down gang lines, as they battle with fists, knives, and verse to be top of the heap. But first among equals in this delinquent Tokyo is the Yakuza boss, Buppa, and in Tokyo Tribe he’s about to remould the city in his own image. Click on the review to read more about this zany, Technicolor riot of a film. 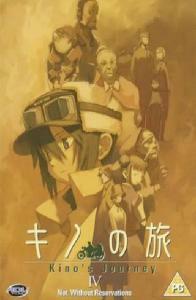 Kino’s Journey. Being an anime fan can be a little cliquish at times. With all the tropes, the fan service, the clichés, the familiar genres and character archetypes, it becomes easy to categorise anime as ‘this thing’. And then once in a while something comes along and transcends genre, transcends even the medium, and you’re left speechless in admiration, wondering why everyone isn’t watching it. Kino’s Journey is one such title. It’s about a traveller named Kino, in an undefined, perhaps future world where the land is divided into small nations, and where Kino travels from country to country on a talking motorrad (motorbike) named Hermes, never staying more than three days. Each country is radically different in terms of culture, of tradition, of technology, and Kino gets to experience it all. There’s a country where children all become adults at a set age following a surgical procedure to have their childishness excised from their brains. There’s a country with a democracy with only one citizen. There’s a country where people only become citizens by fighting to the death in an arena at the whim of a despotic king. There’s a country which holds all the books in the world in a library, but only allows those books deemed safe to be read. There’s a country where mages are revered, but a girl dreaming of powered flight is ridiculed, and more. Kino’s Journey is sort of a cross between Aesop’s Fables and The Twilight Zone, similar in mood to Mushishi, but offering a greater variety in stories, taking the viewer on quite the emotional journey over its thirteen episodes. It’s only through sheer luck that I encountered this series. ADV UK had just folded, and were clearing out their stock at fire-sale prices, and I picked up all four single volumes for a pound each. Here’s a review of volume 4 of Kino’s Journey if you want to read more. The series is well and truly deleted in the UK, although as usual the odd volume might still linger on e-tailer shelves. Given that these are standalone episodes for the most part, it’s a nice way to sample the show. Otherwise second-hand is your best bet for UK discs. However, in its last gasp, ADV US re-released Kino’s Journey in a 3-disc collection, and that is still available on Region 1 import for a very reasonable price. Tokyo Tribe will be released in the UK on Blu-ray and on DVD by Eureka Entertainment on the 15th of June.